In 1973 Bakirov Zh.B. graduated from the Karaganda Polytechnic Institute with a degree in «mechanical engineering technology, machine tools and metalworking». 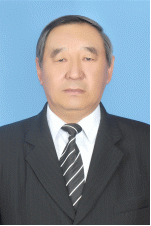 In 1980 he defended his PhD in the specialty 01.02.04 – “Mechanics of a Deformable Solid Body” at the Institute of Seismology of the Academy of Sciences of the Kazakh SSR. In 1982 he received the academic title of associate professor of «strength of materials» chair. In 1999 he defended his doctoral thesis on the specialty 01.02.06 – “Dynamics, strength of machines, devices and equipment” at the Institute of Mechanics and Mechanical Engineering of the MES RK. 2001 he received the academic title of professor of mechanics and engineering. In 2000-2006 he worked as a head of «Applied Mechanics» chair at KSTU. In 2006-2013 he worked as a head of «Mechanics» chair of KSTU. In 2012 he passed training in management education.